Another season series, and another series victory for the Padres. 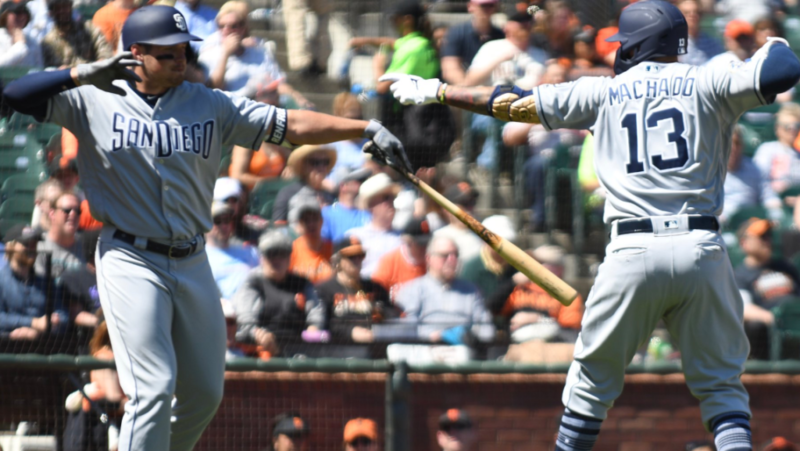 Manny Machado homered again, and rookie Nick Margevicius threw six innings of one-run baseball as the Padres got the victory over the San Francisco Giants by a score of 3-1 on Wednesday afternoon in the Bay Area. After the two teams combined for 20 runs in the first two games of the series, the two sides settled for a pitching duel on Wednesday. Both teams combined for just four runs on 13 hits and both starters threw at least six innings. The 22-year-old rookie Margevicius threw six innings, giving up just one run for the third time this season on five hits with no walks, also adding his first big league hit at the plate. The lone blemish for the rookie phenom was a solo home run by Kevin Pillar, who has torched the Padres since coming over from the Toronto Blue Jays via trade. For the Giants, Dereck Rodriguez hurled seven frames, allowing two runs on four hits, with the Machado homer giving the Padres the edge in the sixth. The Padres took the early lead on a Manny Margot RBI single in the third. Ian Kinsler and Machado had impressive defensive plays to help Margevicius preserve the Padres lead to start the game until Pillar homered in the 4th inning as the Giants centerfielder ends the series with a pair of homers and nine RBI. The game would stay tied until the sixth inning until Machado homered to right field to continue his stellar play early on in 2019. The Giants almost took the lead in the fifth inning, before the umpires went to the replay review and overturned the call. 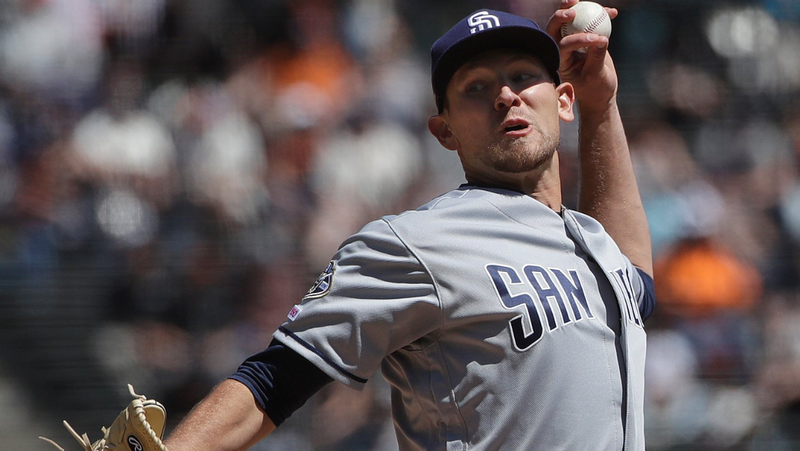 The Padres bullpen overwhelmed again in this one, as Trey Wingenter, Brad Wieck, Craig Stammen, and Kirby Yates combined to throw three innings of scoreless baseball. Wil Myers added an insurance run in the ninth on an RBI single, scoring Hunter Renfroe to give the Padres an extra cushion. Yates came in for the save opportunity and made things a little too interesting in the bottom of the ninth. Yates walked Brandon Crawford and gave up a double to Evan Longoria to bring the winning run to the plate. Yates then struck out ex-Padre Yangervis Solarte before getting Brandon Belt to end the game on a pop fly to Machado at third. For a team with a starting rotation all under the age of 28, they have held it together rather. Margevicius’ ERA dropped to a 1.69 on the year, and the bullpen has continued to surprise people around the league. Fernando Tatis Jr. got his first day off on the season, with Luis Urias starting at shortstop and Kinsler getting the nod at second base. Franmil Reyes came on as a pinch-hitter again, but couldn’t recreate his magic from Monday night as, after hitting a pinch-hit two-run home run, he grounded out to the shortstop in the top of the seventh inning. The Padres have won three of their four series this year and improved their record to 8-5, just a half game back of the Dodgers. Andy Green’s group will head to Arizona for a four-game series starting Thursday, with tomorrow’s starting pitcher still unknown, and “The Sheriff” Chris Paddack on the hill Friday night. Nice win today. Have to admit that Margevicius is a real surprise. Not overpowering, and I keep waiting for hitters to catch up with him but it’s not happening. He’s not overpowering but he has good command, good location . Really seems like he knows how to keep hitters off balance and guessing. Young man has the makings of a pitcher. Quiet as it’s kept, Margot is hitting. Maybe being lower in the order (7th) takes the pressure off. Nice to see Myers rbi single through the right side for that 3rd run. Didn’t turn it over and pull it to 3B /as. Just fundamental baseball. Fit the situation. Keep it up!